If you’re in need of a new car charger or a new FM transmitter, you’re in luck either way. The Anker Roav SmartCharge F0 Car Charger covers both bases. It has dual USB ports so you can connect any charging cables you want. 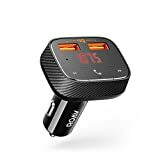 Then on top of that, it has a Bluetooth enabled FM transmitter built right in so you can connect your smartphone and stream music to your car radio even if you don’t have an aux-in port! Use the coupon code VIVAFF22 at checkout and you can snag one for just $12.99. Stable Transmission: Solid Bluetooth and FM connections stream music straight from your phone to your car’s sound system. Rapid Charging: Dual USB ports with Anker’s advanced technology deliver simultaneous high-speed charging to driver and passenger. Qualcomm Quick Charge not supported.